With the upcoming patch, we are adding two new frag grenades to our arsenal. These are the RGD-5 and RGO which were made by SAM61 who allowed us to implement them into the game. In addition to that, [R-CON]KaB adjusted the first person animations so that the grenades fit better into the hands. 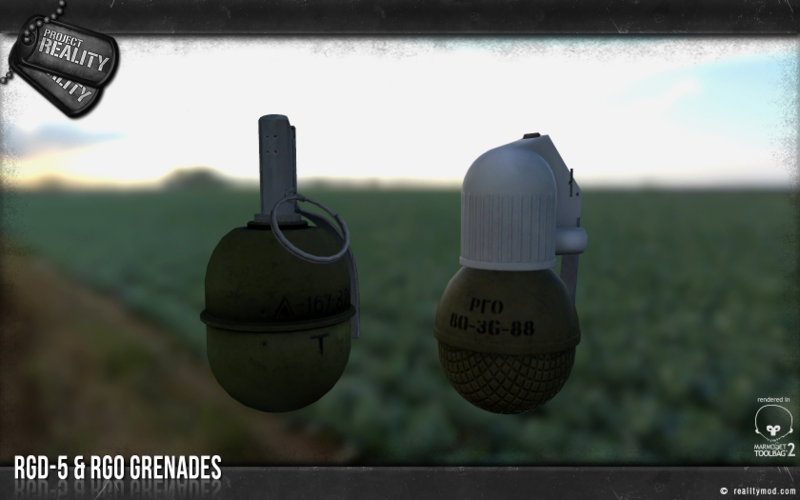 Besides looking nice, they will also update the Russian Armed Forces to finally use an up-to-date grenade instead of the old and no longer produced F1 frag grenade. The RGO will be used by the Russians and the RGD-5 will be featured in unconventional forces. The RGO hand grenade is an impact grenade. This means it will explode on or shortly after impact. We will also represent this in game within the limitations of the engine. Looks awesome. Love the addition of the impact grenade to the Russian forces. I am sure it will be a blast to use . I am sure it will be a blast to use . What a fantastic addition! Something the Russians have really need for a while. So will the Russian Armed Forces just use the impact grenade? That seems kind of strange for a conventional force. Tell that to Russian Armed Forces leaders, why go for RGO. It seems that the RGO will need a short distance to arm, which is perfect for dual use in both bush fighting where you really want to get 45m of a throw, and door to door fighting where you can bounce the thing through a windowsill and then into the bunker/ room.